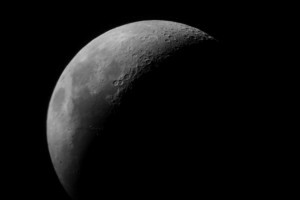 We have a little telescope, and were out looking at the moon a few weeks ago. The image through the eyepiece was just amazing, and I thought I might be able to get a picture of it holding my DSLR camera. It worked out pretty well! Nice photo. Have you screwed the camera mount to the eyepiece or is this looking through the lens into the scope? I need to check out my Canon on the moon. 560mm optical equivalent and 10mpxls should look pretty good. What is the resolution of your telescope? This particular shot was hand-held, pointing the camera (with a lens on the camera) down into the eyepiece of the telescope. Had to take a few shots to get a decent one, but for such a simple setup, it was effective! I have a mount that attaches the camera to the scope as well, but have had trouble aligning it correctly. Not sure why. Camera was a Rebel XT, kit lens I think. Your new camera should do a very good job on its own. Still like it? A friend was asking about cameras today and I mentioned the one you just got. Since I saw your moon picture I have wanted to try mine out (Canon Powershot SX10IS) but it has been overcast. I think I will put it on a tripod and see just how well it does on a clear night. Next full moon is April 20 rising early enough so I will still be awake. I think I will put it on a tripod and see just how well it does on a clear night. With 20x zoom and 10 megapix on a tripod it should be pretty clear. I never had a decent telescope so this might be the next best thing. Oops. Next full moon is April 8, sorry. Yeah, that camera of yours IS a decent telescope!